After moving around every few months for 3 1/2 years, we settled down on my family's grain farm, out of Oilmont. We have been here ever since, over 36 yrs. now. We raised our kids here, they all attended school in Sunburst, graduated, did the college or vo-tech thing, and now 4 of them are living within 45 miles of our farm. Two of the boys are on the farm with their families, one in Shelby, one in Cut Bank, and one in Oregon with her husband. We have 8 grandchildren at present, all of them near us, and we get together often. Our life centers on God, family, & farming. 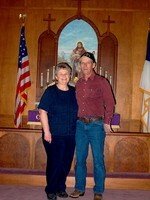 Murray & I standing at the same alter we stood at 38 years earlier. It has been 41+ years now! My son James, with the 6 oldest grandkids. Grandpa & Grandma Taylor, with the 2 youngest grandkids. My boys, Jason & Chad.